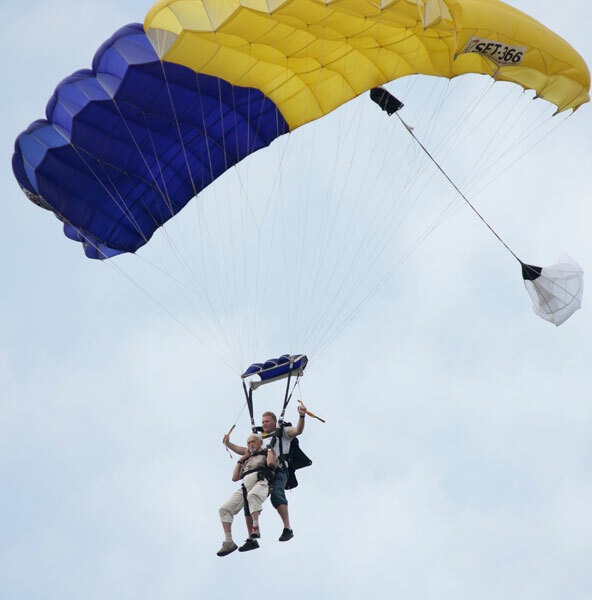 On July 3, Aaron Rosloff took a major leap of faith. 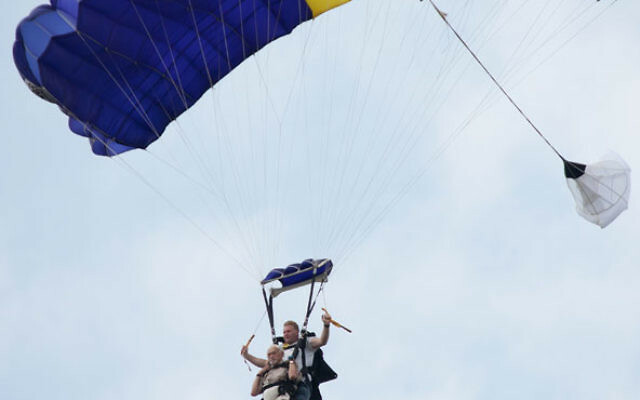 The South Brunswick resident, joined by leaders and members of Congregation B’nai Tikvah in North Brunswick, went skydiving that day to celebrate his 90th birthday. The adventure raised more than $2,000 for the Food Pantry of South Brunswick. However, a number of members began to warm to the idea. When Rosloff took his jump at Cross Keys Airport in Williamstown, he was joined by B’nai Tikvah president Gary Bergman and members Michael Weiss and Hadas Elami. Each jumped in tandem with an instructor. About 30 other synagogue members, including Rabbi Robert Wolkoff and his family, made the 90-minute drive south to cheer the skydivers on. Also joining the festivities were Rosloff’s son and his family, who came from Long Island with a large birthday cake so everyone — even strangers who came over to congratulate the nonagenarian jumper — could join in the festivities on the ground. The skydiving company provided instruction before take-off. The jumpers had to demonstrate they knew all the positions to ensure a safe landing. The leap culminated Rosloff’s lifelong interest in aviation. After taking a few courses in airplane mechanics, Rosloff enlisted in the military during World War II and was assigned as a crew chief at Foster Field in Victoria, Texas, keeping AT6 (advanced trainer model 6) planes in top shape. Rosloff got a surprise at the airport when he spotted a vintage AT6 parked behind the hangar. After the jump, he went over and spoke to its pilot, whose father happened to own it. After hearing Rosloff’s story, the pilot contacted his father, who invited Rosloff to come back for a ride on the plane. “The jump was almost anti-climatic,” said Rosloff. “I was having such a good time with my children’s friends and the others from the synagogue who came out for me; some were young enough to be my children or even grandchildren, but I don’t really have any friends left my own age — and then finding that airplane,” he said. Rosloff said he would have jumped years earlier if not for the strenuous objections of his wife, Millie.